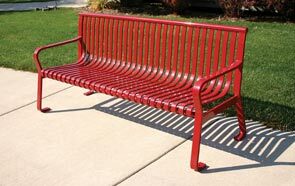 These Metal-ArmorSM coated steel benches Are perfect for outdoor use. These park benches are immaculately designed with coated steel for a stunningly beautiful yet simple park bench that will complement a wide variety of design styles. Available in multiple colors this coated steel park bench is the right choice wherever durable and beautiful seating is desired. The seats are 1/4" x 1-1/2" rolled steel. The arms and legs are made of 5/8" x 2" rolled steel. To protect these park benches from the elements and to keep their finishes looking new for many years, this entire collection is coated with weather-resistant Metal-ArmorSM.